Every employer must comply with FCRA laws and EEOC guidelines that pertain to hiring, background screening and the treatment of applicants and employees. A disclosure informs an individual that your company wants to run a background check on them. This can be for hiring, promotions or other employment-related purposes. Disclosures must be clear, conspicuous and on a standalone document, meaning they cannot contain any additional content. Employers cannot run a background check until they receive written authorization from the person they wish to screen. If the individual does not provide consent, then a background check cannot be run. Employers can take adverse actions (denial of employment, promotions, etc) based on the results of a background check, but only after following a three-step process that was established by the FCRA. Step two is to give the person a "reasonable" amount of time to review this information and file a dispute if warranted. No specific time frame is provided but a common time frame is two weeks to one month. If a dispute is filed, then a follow-up background investigation is required. If no dispute is initiated, then step three is to send the person written/electronic notification about the adverse action, a second copy of the "Summary of Consumer Rights Under The FCRA" document and contact information for the consumer reporting agency that compiled the background check. Learn more about the FCRA. The Equal Opportunity Employment Commission (EEOC) enforces federal anti-discrimination laws based on protected factors such as race, color, age and gender identity. When employers are charged with discrimination, the EEOC is authorized to investigate. They determine whether or not a discriminatory practice occurred and, if so, attempt to settle the charges. Should this not work, the EEOC may escalate the case and file a lawsuit against the employer. Discriminatory Hiring Practices Employers may not publish advertisements, implement recruiting policies or discriminate against job seekers. Policies Employers may not base decisions about job duties, promotions, wages, benefits or other work-related items based on any protected factor. Harassment Employers may not harass employees or take action against an individual who files a complaint if an act of harassment occurs. Discrimination Employers must make reasonable accommodations to allow employees to practice their religious beliefs. Employers that do not comply with FCRA and EEOC regulations could be subjected to investigations, fines and costly lawsuits. The team at Backgrounds Online is available to help with your compliance efforts. • Using separate Disclosure and Authorization documents. 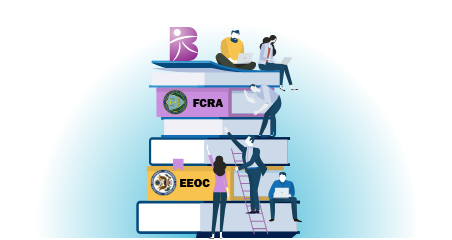 Backgrounds Online strongly recommends that every employer discuss FCRA & EEOC regulations with their legal counsel when developing internal policies. Our team can review these policies with you but we do not provide legal advice.